There were tons of beautiful dresses that I would like to feature for the Peony Parade, but I just choose two for today :) Be sure to look at the rest of them in the Flickr Group. hopefulmorning's version is so gorgeous and red is definitely her color! Like many of us, she had a list of alterations to make, plus she changed the skirt into a circle skirt. You can read more about her dress on her blog. 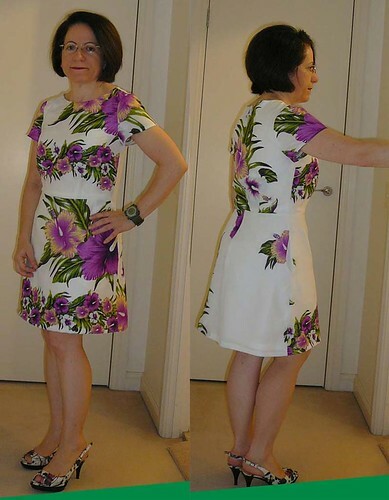 Velosewer chose a beautiful fabric for her dress, you guys know how much I love Hawaiian fabric, right? ;) This dress was her "test" version, but it looks pretty perfect to me! I'm really pleased you liked my test version. It's so comfortable to wear and I love it too. 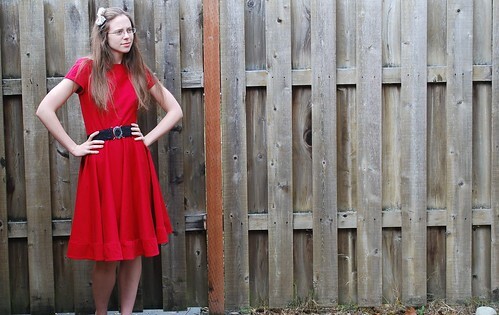 Oh the ever present Peony dress! Thanks for sharing these two wonderful versions. I really love hopefulmorning's version - the circle skirt is a great change of design! I really like how Velosewer played around with the placement of the print in her dress. It's quite fetching, and it really brings drama to a very classic dress. Thank you so much for featuring me. I'm glad you liked my dress. I loved velosewer version... It's very chic..